Every good story needs a good villain, right? A Discovery of Witches definitely brings us that in Peter Knox and Juliette Durand. Check out interviews with Owen Teale and Elarica Johnson! Happy A Discovery of Witches week! The TV series is finally coming to the USA, and the entire first season of will premiere simultaneously on Sundance Now (AMC Networks’ direct-to-consumer SVOD service) and SHUDDER (premium streaming service for thriller, suspense, and horror) this Thursday, January 17, 2019. The series unfolds as magical creatures (witches, vampires, and daemons) are becoming extinct. Matthew Clairmont (a vampire and geneticist) has spent several centuries investigating the origins of each species and their evolutionary path to find answers. A book at Oxford’s Bodleian Library, Ashmole 782, holds the key to these questions, yet it’s been bewitched so only Diana Bishop, a visiting scholar and witch, can access it. Now magical creatures have descended upon Oxford, desperate to get to Diana and this book. It’s in these circumstances that Diana and Matthew team up to uncover the truth of the three species. What unfolds is a cross-continental adventure, filled with danger, mystery, and romance. As I’ve previously said, Teresa Palmer and Matthew Goode are fantastic in their roles as Diana and Clairmont! 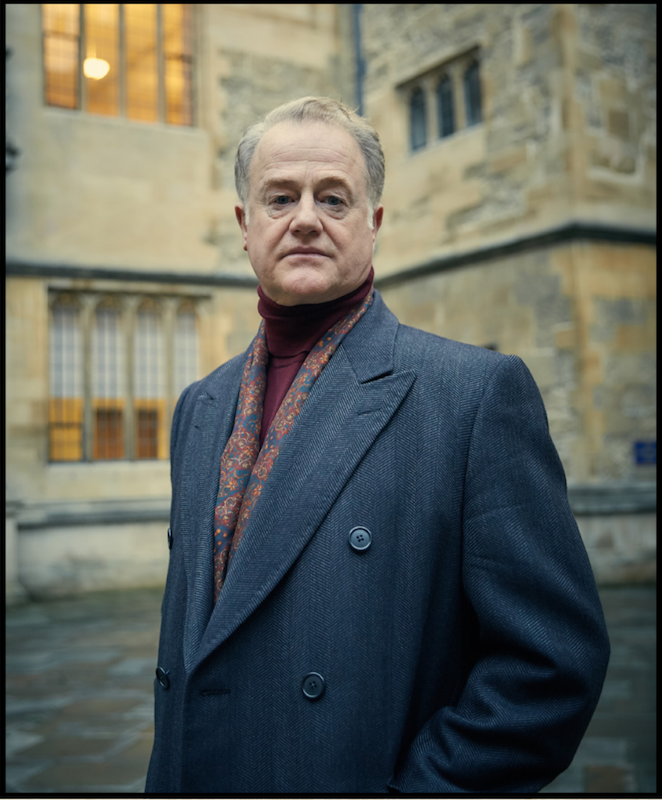 But as we know, every good adventure depends on strong antagonists, too, and A Discovery of Witches definitely brings us that in Peter Knox (Owen Teale) and Juliette Durand (Elarica Johnson). Thanks to AMC/Sundance TV, we have interviews with Teale and Johnson as they introduce us to their characters and motivations, plus give us more details about the behind-the-scenes process of filming! Did you enjoy playing Peter Knox? I’ve enjoyed playing him enormously because he’s a complex, flawed, talented, rather charming character. He has a past, he has made mistakes, he’s learning to live with them by trying to do the right thing, as he sees it. There is a political assembly where the witches, daemons and vampires meet, and Peter is a very big force on that council. There is not much mutual trust between the vampires and the witches, it’s great fun to play. To be honest, it was those parts that most attracted me to Peter Knox rather than a scene which involved ‘witch wind’ for example. Stunts are fun, of course, but anything that has that human complexity with parallels to real life is really worthwhile. It’s honest, and deep, and you feel like you’re really giving something there; giving insight into being human. That’s what I love about spending time with Peter Knox. What sort of witch is Peter Knox? Peter Knox is a witch who is academic in his approach and thorough and therefore has studied it like nobody else. He has to enlist people with greater powers than himself when needs be, which brings him into contact with Satu. Knox has a set of rules but Satu doesn’t know thereare any rules, which is great fun in filming. He brings her on board, but she keeps doing her own thing, she’s autonomous and he can’t understand it. I love that side, working with Malin has been a rare joy. Can you describe Malin Buska’s portrayal of Satu? this is a wonderful quality of Satu. There’s great power in it, there’s a power in her own vulnerability which is absolutely captivating, and she brings this so clearly to Satu. Can you describe the complexity of the set and the brilliant use of space? it the set won’t work and the magic will be gone. The team on this are second to none! The designer James North is a genius when it comes to recycling. When a big set piece is used for one set, he will find another use for it; a piece of the Bodleian Library might end up somewhere like the Congregation, that’s the sort of vision we have here. As an actor, all of this just makes your job so much easier. Another wonderful set of James’s is the Witches’ Archive. Can you describe that? The Witches’ Archive is the main library of books Knox learns his powers from. It’s somewhere I would love to return to on a regular basis to try to understand what’s going on there. Although you do definitely feel, once you start poking through the jars and specimens, that perhaps you don’t want to know what’s going on at all! What can you tell us about working with Trevor Eve? I relished getting to work with Trevor Eve. He always sets the bar very high, I’ve always enjoyed watching him. In the show we are on opposing sides. Peter Knox is messing with the devil by getting involved with Trevor’s character, Gerbert. Gerbert is something else, he is definitely not human, and something about Peter Knox is very human. On the subject of parallels with real life, let’s talk about the show’s themes about intolerance. So, Peter Knox is a very driven character, and he is obsessed, as he sees it, with putting people into their rightful place; however, some might argue that it’s shifted into megalomania. He is a very political figure, you could say a presidential figure, on behalf of the witches. These parallels certainly weren’t lost on me, and I hope it isn’t on the audience. You will watch A Discovery of Witches and think, “Oh, this reminds me of something”. It’s entirely intentional, and I think that is a credit to Deborah Harkness and Kate Brooke’s writing. Through Peter Knox, we are able to reveal that obsession with a goal is going to make you intolerant, and intolerance will not work if we are to co-exist in this world. That seems to have come up again and again in humanity. We fear the unknown, and we judge and blame, rather than attempting to understand and accept, each other. Knox is deeply cynical about vampire and witch nature. He feels they can never truly live together, and he would rather kill than be killed. Tell us about your character – what is she like? is controlled by him in a not so nice way. He is manipulative, mean and gets exactly what he wants, and he is like that with Juliette – he gets her to believe the things he says and do the things he wants her to do. And how did Juliette become a vampire? Gerbert found Juliette in a brothel in Cairo in the late 17th century and decided to take her under his wing. He wanted her to seduce and eventually kill another character called Matthew, so he has taken her and she lives with him in his palazzo in Venice. She has been a vampire for hundreds of years. What characteristics do vampires have? They’ve got incredible senses. They are able to hear extraordinarily well. They talk to each other very quietly and from long distances. So if Juliette is on one side of the palazzo, she can hear Gerbert from the other side. They are also very quick as well. When Juliette is trying to find her prey, as such, she moves quickly and it’s quite scary, deadly in fact. So they are a little bit intimidating, very strong characters and very glamorous. She in particular has really lovely clothes, very nice outfits – very bling! Tell us about working in Venice. Venice is beautiful. I had never been before and it was always somewhere I had wanted to go. I came home and told everyone they have to go, even if it is just for one or two days, just to experience the bizarre feeling of not being in cars all the time. You arrive at the airport, you go to the pier, you get on a boat and that takes you everywhere. It’s stunning! The views and buildings are beautiful. It is very weird but, after a day or so, you get used to being on the water all day and that if you want to pop to the shops you have to jump in the boat. In the centre, though, there are lots of little streets to walk around and really great old stores. It is a fabulous place for Gerbert, Juliette and Domenico. Everyone should go. In episode two we are introduced to your character and she has a dramatic impact when she sees this young guy and takes him. Can you describe that blood lust? She does. It’s a beautiful place in Venice, so you get to see the bridge, the water and Juliette sat very still among the public. And she finds Matthieu, who is a kid on a school trip, and she just watches him. She’s in part attracted to him because he reminds her so much of Matthew Clairmont. These really quiet moments are so strong, but she has this vampire thirst to get to him and she sees him, wants him and that’s it. And it’s about her following him through Venice and watching his every move. The way it’s been filmed has been fabulous in general, the exteriors look so cinematic. But also this chase, this slow chase, this prowl, almost like a leopard with its prey… and then ending up in the final moment, where she gets what she wants. In this world, vampires, daemons and witches live among humans in plain sight. How do they manage to go unnoticed? You wouldn’t know unless you were looking around at everyone in coats, quite warm and casual, and then you saw Juliette in her wonderfully glamorous outfit with no jacket on, just looking around and taking in the public. She sticks out, but as you said, we are among everyone in plain sight. What is Juliette’s connection with Matthew Clairmont? When we meet Juliette, she is madly in love with Matthew Clairmont. She had been many years ago but then they were split up and 200 years passed. But deep down she still has love for him and wants to be with him. We see them back when they were together and it’s so beautiful and they’re so in love, so the 200 years did leave quite a large space between them, but then we see them come back together and little moments of how much they did love each other. Gerbert always knew Matthew would be attracted to her, as would she. But what most people don’t know is that Gerbert trained her to be the perfect partner for Matthew and this involved him teaching her extensively about subjects including philosophy and science. What did you think of Wales, where a lot of the filming took place? Wales is fantastic, it’s a beautiful place. This was my first time there and the people were lovely. We spent most of our time in the studio, so we didn’t get to see much of it unless we were in the car. So during our long drives down, if we were on location in the Beacons for example, we got to see the greenery, the animals. I was really excited by the sheep – there aren’t many in London. It was a great experience to be there.